Please don’t “mock” me for writing this post about this immensely popular film. It seems like an appropriate time with the release of the new Harper Lee book. I haven’t delved into film criticism about it except whatever I have heard in a film class. So if you have read what is written here before, my apologies. I think the music by Elmer Bernstein adds so much to this movie. It ranges from simple nursery rhyme-like sounds to lush instrumental orchestration which mirrors the duality of the narration by an adult telling the story through the eyes of her childhood. The triumph of the story is how well it puts the audience into the perspective of the children and chronicles the confrontation of their, as William Blake would say, youthful innocence with the experience of the fallen-from-grace adult world. The grown-up character of Scout provides the setting. It is in the fictional Alabama town of Macomb in 1932, during The Great Depression. Thus, we know these are desperate times, which can exacerbate the problems that already exist in society. That is why the narrator tells us that the summer seemed hotter and the days longer. (Of course, time seems to speed up as we age and get closer to our own demise). 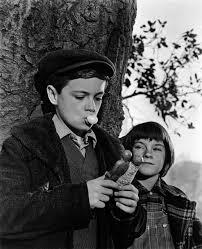 In the year in which the story takes place, Scout (Mary Badham) is six years old. Her nickname implies that she is on the lookout for a path to follow, in this case the road to adulthood. 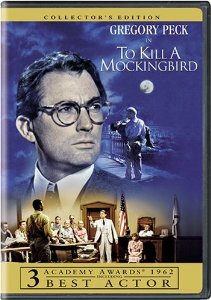 Her father, lawyer Atticus Finch (Gregory Peck, in an Oscar winning role, and the character voted by the American Film Institute as the greatest hero ever in motion pictures), is forced to expose his uncorrupted children to the evils of the world. It is ironic that by trying to do the right thing that he places his family in jeopardy. 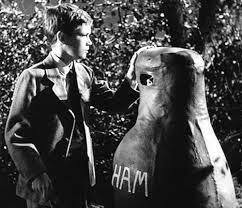 Scout learns that they are poor, but a town resident, Mr. Cunningham, is so impoverished he can only pay Atticus with hickory nuts. Her father must explain to Scout that bringing attention to Mr. Cunningham’s repayment visits only embarrasses the man by emphasizing his deprived state. The anger that poverty engenders needs an outlet and the venting of this rage may be misdirected at a convenient target, in this case an African American. By introducing the character of Dill (John Megna playing the role inspired by author Harper Lee’s childhood friend Truman Capote), we learn by way of explanation the supposed story of neighbor Boo Radley. Scout’s older brother, Jem (Phillip Alford), says Boo’s father is the meanest man on earth, locking up his son, who is described as a maniac. This rumor is supported by Dill’s aunt (Alice Ghostley). The children play “dare” games that involve touching the Radley porch. When Scout, rolling in a tire, crashes onto the porch, we see a distorted huge shadow of Boo that looks ominous, approaching Jem. But, a shadow, no matter how surreally large, can’t hurt anyone, and this image emphasizes the falsehoods surrounding Boo’s supposedly menacing personality. We see the shadow retreat when the fear of the children is obvious to him. Later, when they are sneaking around the Radley house, Jem’s pants get caught on a wire fence, and he must remove them to escape being caught. When he goes back to retrieve them, they are folded, as if “waiting for him.” Jem also finds objects such as a pocket knife, pocket watch, marbles, and carved wooden dolls that are images of Jem and Scout. They are placed in a hole in a tree. Mr. Radley (Richard Hale), cements the hole, symbolically emphasizing how he has stopped the world from knowing the truth about Boo. The latter is ironically named, since he is the one giving the children the gifts. He is the made up monster of the children, whose form and house are seen in dark shots suggesting the nightmare realm of the imagination. But, they learn that he is their guardian against the real evil that exists in the supposed safety of the civilized world of the town. That evil is incarnate in the figure of Bob Ewell (James Anderson), the father of his allegedly raped daughter, Mayella (Collin Wilcox Paxton). He is a drunkard who beats his daughter and puts the blame of his brutality on the innocent African American, Tom Robinson (Brock Peters), who Atticus defends out of his sense of morality in the face of the viral-like bigotry spread by patient zero, Ewell. As Atticus says in his court summation, Mayella tells lies about Tom assaulting her to cover up her “guilty” act of kissing a black man. The town spreads its false stories about black men not being trustworthy around white women just as the occupants have propagated falsehoods about Boo. But even in the face of facts about Tom’s inability to strike Mayella because of his paralyzed left hand, the jurors, having been so indoctrinated that they believe their bigoted lies, convict Tom. He is driven to despair, and is killed trying to escape. Atticus is the true Christian in this tale, as he does not retaliate against the confrontational Ewell when the latter spits in his face for defending the “immoral” black man. 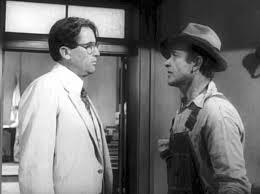 Morality is turned upside down when prejudice rules, since Ewell preaches earlier to Atticus that he “has children of his own” and should realize the threat that people like Tom Robinson pose. That scene is ironic, since it is Ewell who tries to attack the children later. Atticus is able to shoot a mad dog because it is a threat to his children, because the animal has a disease it can’t control. 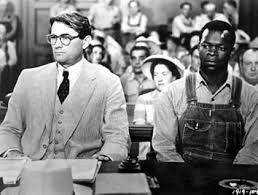 But he can’t hurt Ewell, because Atticus is a civilized man of the law, who is supposed to respect human life. However, the long shot of Ewell from Atticus’ car as he drives away from the Robinson home makes Ewell remind us of the rabid dog in another scene that must be put down. And that is why the character of Boo is a complicated figure. 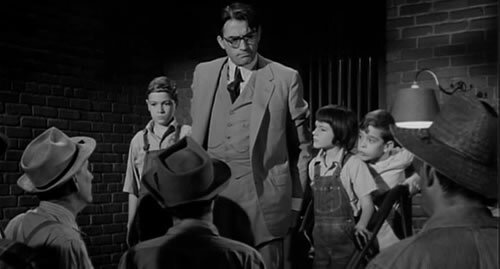 Atticus earlier tells a story about how his father said that he should never shoot at a mockingbird, because they do nothing but sing and bring goodness into the world. 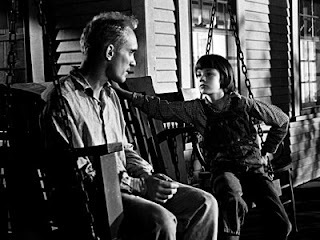 Later Boo (Robert Duvall in his film debut) is directly likened by Scout to the mockingbird, which becomes the symbol for innocence. If they reveal that Boo saved the children, then he will be brought into the limelight, which will also expose him to the corruption of the adult world. He is a before-the-fall-character, in the Biblical sense, existing outside of the society’s law. Atticus cannot eliminate the evil Ewell, but Boo can kill him because he is an instrument of divine retribution, used to protect the innocent children from the evil of the grown-up world. There are nice directorial and script touches in this film. The empty, rickety swaying swing on the Radley porch, which appears desolate and ghost-like early on in the story, is replaced at the end of the film by the Finch porch swing which is inviting, and on which Scout sits with her non-apparition hero, Boo. When Jem is parked outside the Robinson home while Atticus is inside the house, Ewell approaches the car in a menacing way. His hands press against the window glass of the automobile, as if threatening to crack through the protective enclosure of the child’s pure state. This image is later echoed when hands attempt to get at Scout in her shell-like Halloween costume. All we see are the groping hands, which produce a visceral fear, again placing us emotionally in the vulnerable position of the child whose innocence is being attacked. Innocence also becomes a weapon against narrow-minded bigotry since it brings the men bent on lynching Jim Robinson at the jail back to their pre-fallen state as Scout addresses Mr. Cunningham as a human being, and talks about his son. It is difficult to be part of a mob when you are forced to confront the basic human decency of an individual child. Another scene which emphasizes the above theme of the positive nature of innocence takes place when the children want to see their father participating in the Robinson trial. There is no room for them on the first floor where the white people sit. They must go to the balcony where the black folks are relegated. But, to the children, there is no stigma about where they sit. They just want to see the proceedings. But, while watching the events unfold, they become initiated into the ugliness of the prejudice which resides where they live. So, to kill a mockingbird, in the context of this tale, is to destroy the purity of innocence.